One return in the mail today. 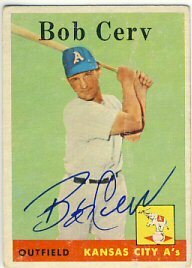 My son received a 1958 Topps signed by Bob Cerv that he sent out just one week ago. My son enclosed $5 with his request. 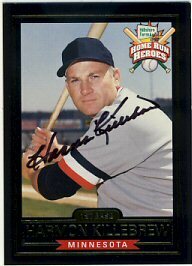 Mr. Cerv was kind enough to include a signed Diamond Signatures card as well. I have very few requests out now. 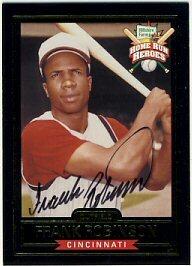 I need to hit a card show soon and get some more cards to send out. My son received a nice return yesterday. 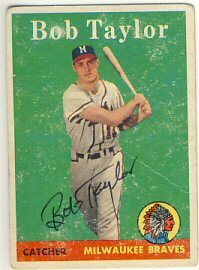 Bob "Hawk" Taylor signed his 1958 Topps that was sent back in January. I also received yet another purchase from Insidersports.com: a Bob Feller signed American League ball and a Billy Herman signed National League ball. 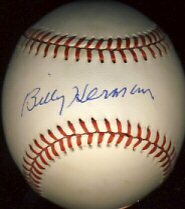 I already have two Feller balls, but even as a pair, the Herman ball was a pretty good price. 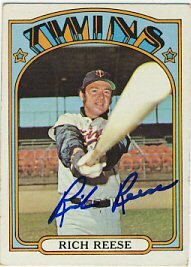 No ttm returns today but I did receive a signed card I bought on eBay from a fellow SCN member and Twins collector. 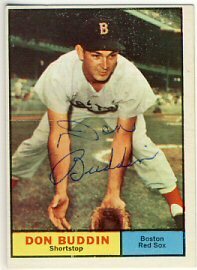 I was able to add a Don Buddin signed 1961 Topps to my set collection for a reasonable price. Thanks Randy! 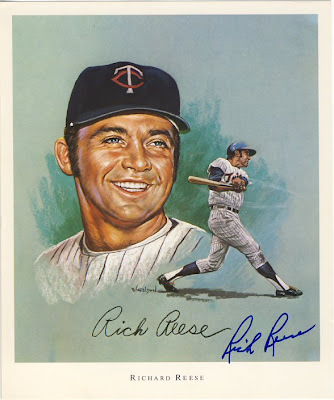 Nothing in the mail today but yesterday I received two ttm requests. 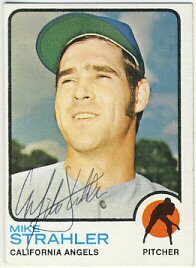 Mike Strahler signed his 1972 and 1973 Topps. 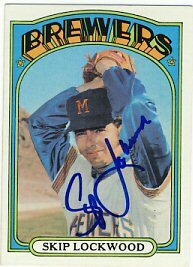 Charlie Hough also signs through the mail so the '72 Topps is off to him next. 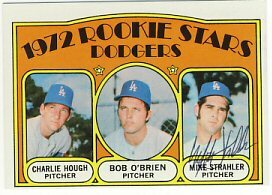 Looks like I might have a lot of these 1972 rookie cards with two of the three players signing them. 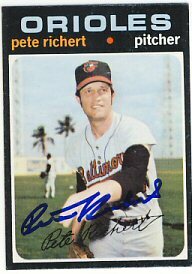 Pete Richert signed his 1971, 1972 and 1973 Topps for me. I sent both of these requests back on April 11th. It's nice to see some of these requests that have been out a while come back. There were two returns waiting for me in the mailbox today. 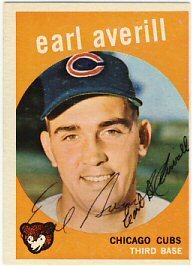 Earl Averill signed a 1959 and 1961 Topps. 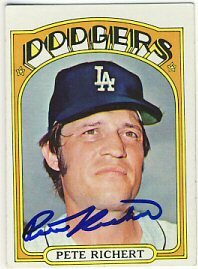 He also replied to my letter answering my question regarding his career after his playing days. 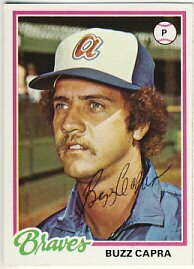 Buzz Capra signed a 1972 Topps. 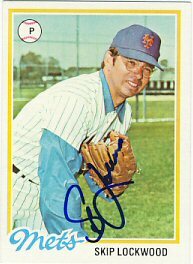 already signed by Jon Matlack. 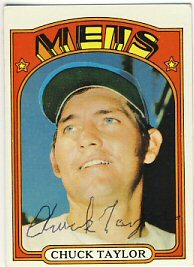 and a 1978 Topps. 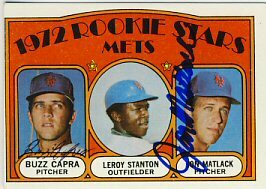 The last player on the 1972 Topps, Leroy Stanton, doesn't appear to be a good signer through the mail. 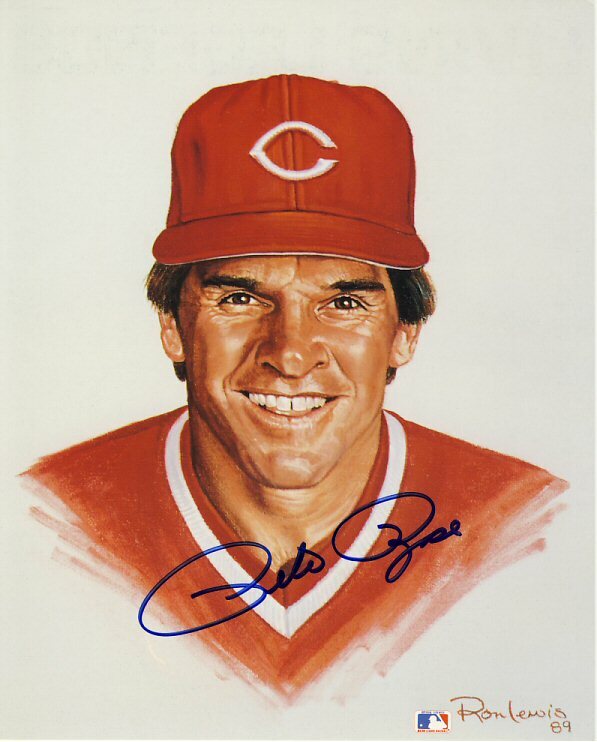 I'll have to wait and see if he's available at a private signing. I received one return today, which I was happy to see considering it's a Tuesday and I don't have many outstanding requests. 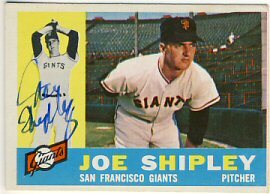 Joe Shipley signed his 1960 Topps for me. 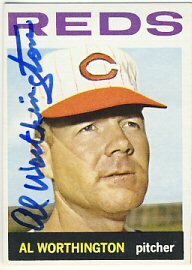 Turns out I already have this card signed by him. I guess my collection is getting too big for me to manage. 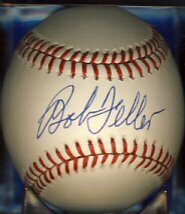 I also scanned in a couple of the purchases I made recently from insidersportsdeals.com. 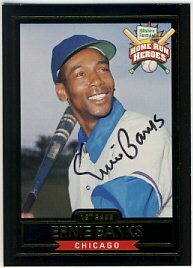 First, I purchased three 1999 Hillshire Farms Home Run Heroes cards signed by Harmon Killebrew, Frank Robinson and Ernie Banks. I believe I paid roughly $9 each for these including shipping. 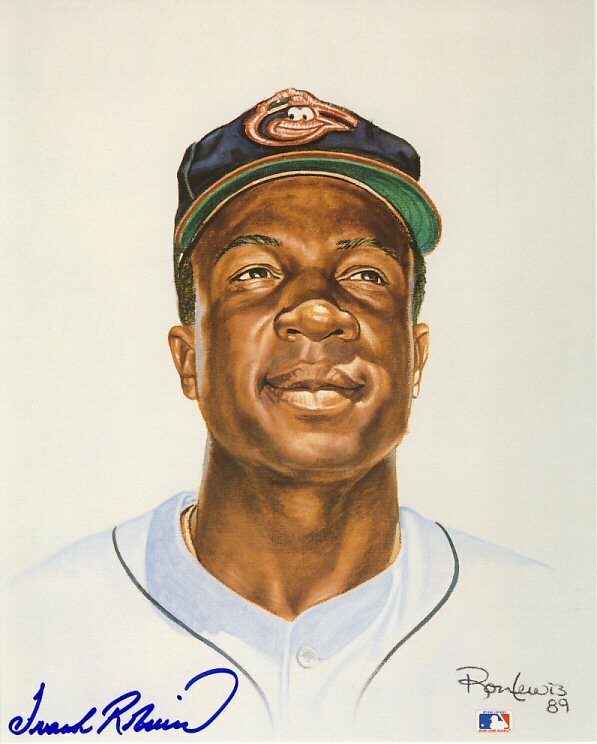 Next, I got back the four Ron Lewis Living Legends portraits I bought recently. 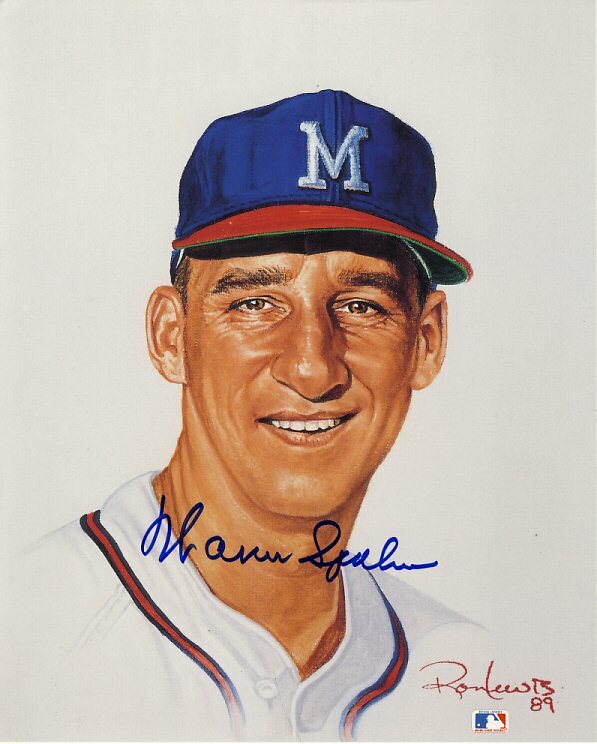 These are nice 8x10 portraits on a heavy card stock signed nicely in blue sharpie. 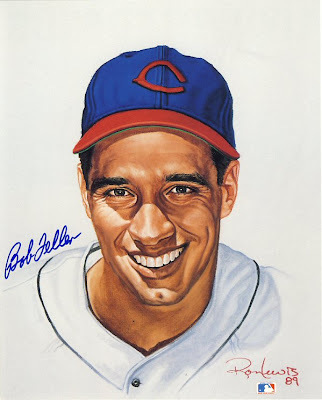 I paid a little over $15 each for Pete Rose, Bob Feller, Frank Robinson and Warren Spahn. 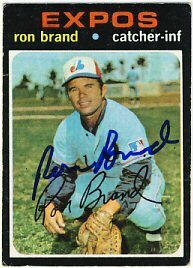 Both the portraits and the cards are authenticated by TriStar. I am especially happy with the portraits and am going to try to get some more of these signed. There's a nice Whitey Ford portrait that will be my first goal. 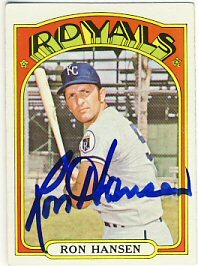 One return today: Ron Hansen signed his 1972 Topps for me in just 7 days. Not much else to report. I haven't had time or cards to send out lately so I expect things will slow down quite a bit. My 11 year old son, the pitcher, has tendonitis so he's most likely done pitching this year. Physical Therapy starts Friday. 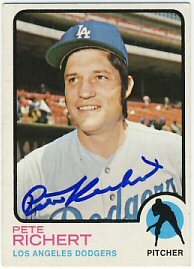 He might play some first base, possibly second base or just hit. 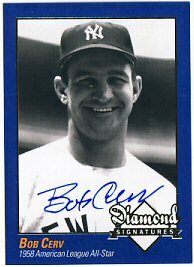 He has been hitting well this year, but 11 years old is pretty young to be a DH. My older son's game was rained out tonight. Just one return in the mail today and it's a great one. 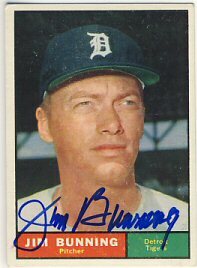 Jim Bunning signed his 1961 Topps for me in about two and a half weeks. We had a busy weekend. 9 games between my two sons. My younger son's team ended up in 4th place in their 8 team tournament, and my older son's team didn't make it into the top 4. A couple of returns today as well as an eBay purchase. 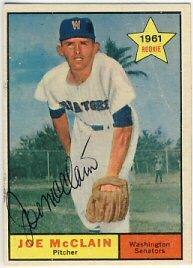 Joe McClain signed his 1961 Topps. 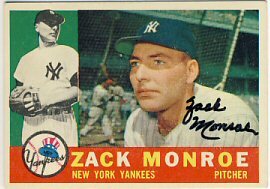 Zach Monroe signed his 1960 Topps. 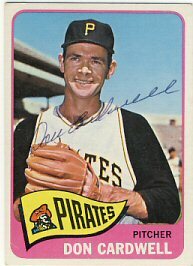 I bought a 1965 Topps Don Cardwell on eBay that arrived today. My sons' baseball tournaments are going well. They've each won two games and lost one, good enough to move to Sunday's bracket play. I was at my younger son's games today. In the game they lost, they game back from being down by 4 runs. My son was up to bat in the top of the 6th inning (they only play 6 innings) with 2 down and the tying run on third, and the go ahead run on second. 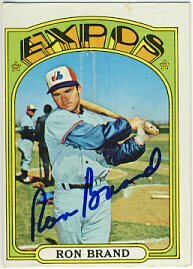 He had two strikes on him and fouled several off before hitting a nice line drive up the middle. The runner on third scored to tie it up and the runner on second was thrown out at the plate. Unfortunately they lost it in the bottom of the 6th. A pretty exciting game. I'm trying to catch up from the last couple of days including adding the pictures to my last post. 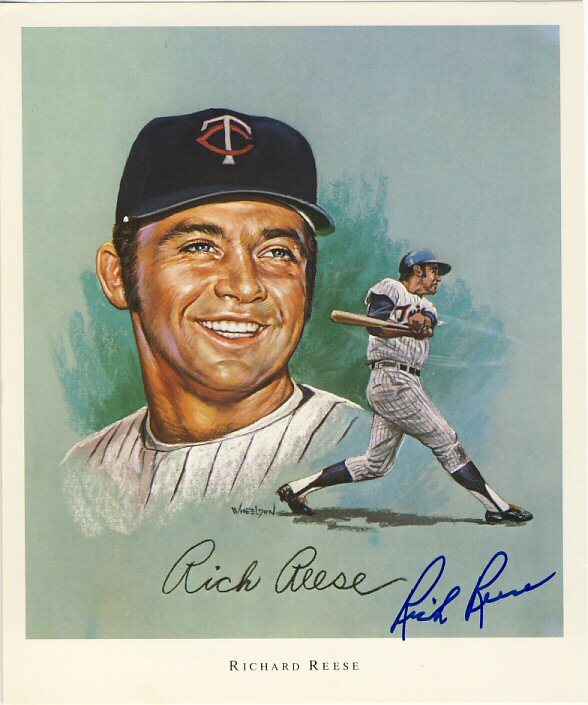 On Wednesday I got back a great return from former Twin Rich Reese who signed a 1970 John Wheeldon Super Valu give-away print for me as well as a 1972 Topps. I included $10 with my request which he returned along with the pen I also included. 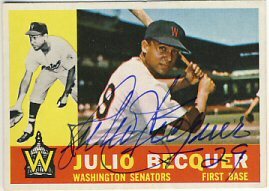 Also on Wednesday I got back a 1971 and 1972 Topps signed by Ron Brand and a 1960 Topps signed by former Twin Julio Becquer. Both wrote short replies to my letter and signed those as well. 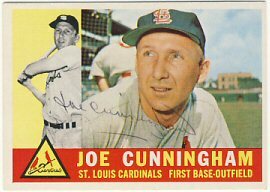 Finally, yesterday I received a 1960 Topps signed by Joe Cunningham. Both my sons have baseball tournaments this weekend. My older son's team just won their first game and will play two more tomorrow. My younger son has three games tomorrow. Between the two of them, they'll play at least 11 games this week and more if they do well tomorrow and make it to the bracket play on Sunday. 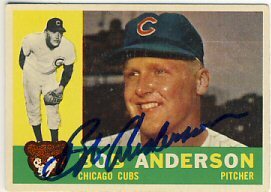 Five More Through the Mail Autograph Returns Today! The returns keep rolling in. 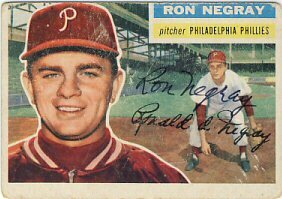 I received a 1956 Topps signed by Ron Negray. Mr. Negray played for the St. Paul Saints in the '50's and wrote a short note about his playing time there. 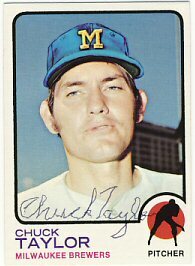 Chuck Taylor signed his 1972 and 1973 Topps as well as the extra 1972 Topps I had enclosed for him to keep. 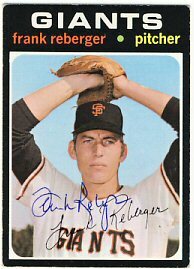 Frank Reberger signed his 1971 and 1972 Topps. 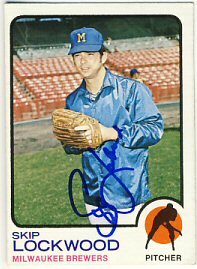 Skip Lockwood signed his 1972, 1973 and 1978 Topps that I sent to him last September. I love getting back unexpected returns like this one. 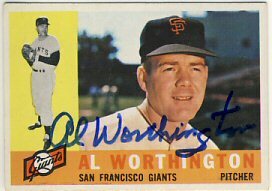 Finally, Al Worthington signed his 1960 and 1964 Topps as well as a couple of photocopied articles and a religious pamphlet. I'm hoping to get one or two requests out in tomorrow's mail but otherwise it will be at least a week before I get any more requests out so things could start slowing down for me. Today was a nice day at the mailbox with six returns. 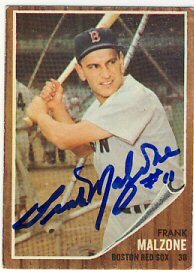 On May 27th I sent out about 15 requests, mostly 1960 Topps that I picked up for $1 each at the last TCSCC show I went to. 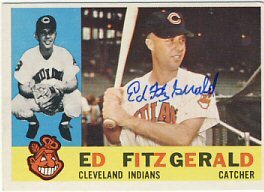 I received 1960 Topps back from Bob Anderson, Ed Fitzgerald, and Hal Naragon. 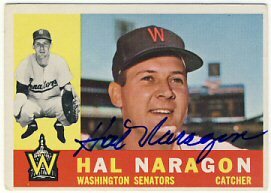 Mr. Naragon, a former Twin, wrote me a short note thanking me for writing and wishing me good luck with my collection. 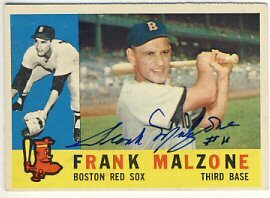 Frank Malzone also signed a 1960 Topps as well as a 1962 Topps. 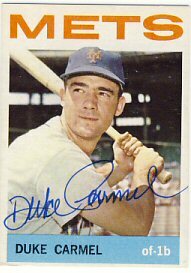 Duke Carmel signed a 1964 Topps. 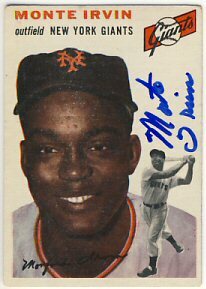 Finally, Monte Irvin signed a 1954 Topps. I had enclosed $10 with my request. 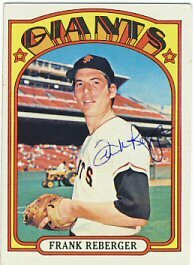 I'm running low on cards to send out. 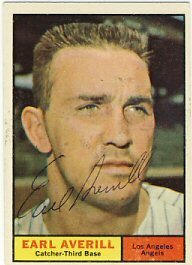 I am going to send a baseball to Carl Erskine and might think of a few other guys top send baseballs to. I also need to go through my stack of magazines and see if there are any to send out.